Won Tons – Simply Sundays! And the best part is that they are not the hard to make! Especially when using store bought Won Ton wrappers! Now we have a Won Ton! Now that we have made one it is assembly line time! You can definitely use some family members here to crank these out! Delicious and tasty Won Tons!! We served this with our dipping sauces on the side!! Aren’t wontons just so much fun to make? You can choose a variety of stuffings too! Love these! This definitely looks like I need to make won tons now! I said for so long that I must make some and the crispiness of those definitely appeals to me hugely. I am drooling over here and I cannot wait to make those. Recipe saved! Awesome Ramona! Hope you like them!! 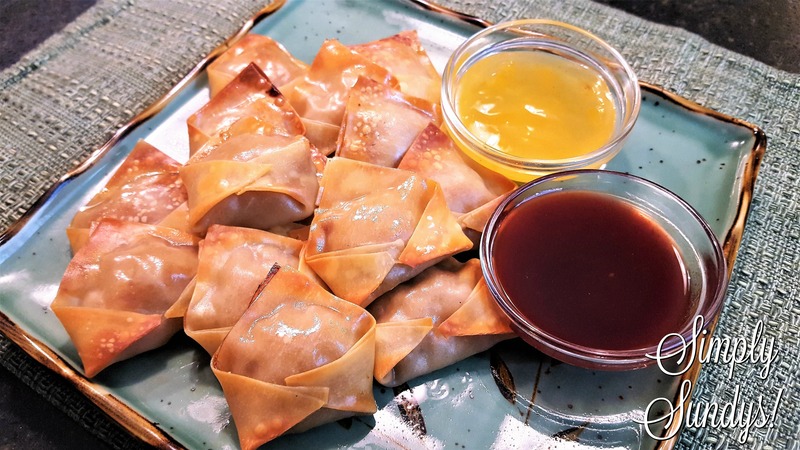 They look fantastic, I’ve just stuck won ton wrappers onto my shopping list for the next time I head to the Big City… It has been far too long since I have made them, and that sauce sounds wonderful! Thanks Brian! Hope you enjoy them! These sound perfect for a starter for a party— a football Super Bowl party! It’s round around the corner and I am so making these. Wonton make such a great snack or appetizer. And I am so intrigued to try the grape jelly-chili sauce! It’s actually quite good! My Mom always made it when we were kids because we never had duck sauce!